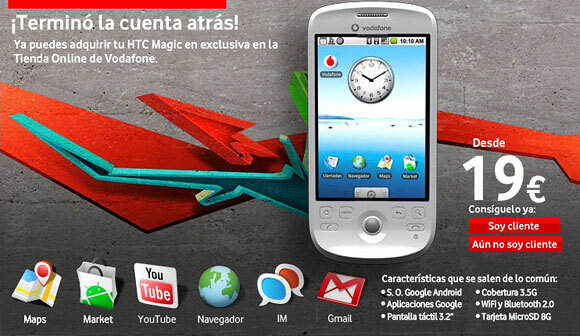 Perhaps you’ve already heard that the HTC Magic has just launched with no other but Vodafone Spain. But you may not have heard that the coveted Cupcake update (also known as Android OS 1.5) is now available to Android Dev phone users via the HTC website. We really hope it will be ported to other G1 users with root access soon. The HTC Magic is the second Android phone by HTC after the HTC Dream (a.k.a. T-Mobile G1). We already reviewed the G1 and we were quite happy with the perspectives for the new mobile OS. There certainly is some missing stuff, but a lot of those misses are taken care for in the latest version of Android called Cupcake. If you happen to own an Android Dev phone, you can get yourselves all dressed up with a new OS by following this link. However if you don’t own a Dev phone, but you live in Spain, you might as well get yourself the updated OS along with the latest hardware. Not only does the HTC Magic come with all the latest Androidish goodies, but it’s also got a slimmed down waistline by shedding its bulky hardware QWERTY thumboard and it’s now available with Vodafone Spain. The HTC Magic can now be had only on a 18-month contract from 19 to 199 euro depending on the choice of monthly plan. Whatever your tariff however, there’s an obligatory 12 euro monthly for unlimited browsing as according to Vodafone the handset uses internet connection automatically even without user intervention and having a data plan is a must. Anyways, we wouldn’t even imagine enjoying the full potential of the Google cloud services without a monthly data plan. But hey, it may be just us. The magic and Dream will be launched through rogers wireless here in canada on June 2nd. im so happy, eh! i am working for vodafone and the HTC magic is much more better than the iPhone!! !